The H.Upmann Coronas Junior Tubos is a simple and cheap Cadete cigar, of 36 ring gauge, 4’5” (115mm) long and comes in a box of 25 cigars in aluminum tubes. Ideal for a short smoke on the go, it can also be easily stored and aged thanks to its beautiful aluminum tube. Mild to medium smoke, that gives delicious flavors of wood, spices, sweetness and some hints of nuts. Great pick for someone looking for typical Cuban aroma while being easy on the wallet. The H.Upmann Coronas Junior Tubos is a great cigar for a short break and for a first Cuban smoke. • Mild to medium cigar, with delicious flavors of cedar, spices, sweetness and some notes of cream and nuts. • Ages very well in its tube. 4 or 5 years on, the cigar is even more complex and creamier. This cigar simply gives you a great bang for your buck: great construction and amazing taste. 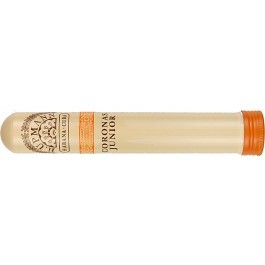 The H Upmann Coronas Junior comes in an elegant aluminum tube that preserves the cigar’s freshness. Upon opening the tube, delicious aroma of Cuban tobacco reaches the nostrils. It reveals a nicely rolled cigar with a dark brown wrapper. It feels firm from head to toe with no spongy areas. At cold, the wrapper smells of barnyard with some hints of honey and oat. The cap cuts easily and reveals a good draw, perhaps just a bit on the loose side. Upon lighting the cigar, the burn is sharp and even; beautiful. It might just require one touch-up throughout the whole smoke, but other than that, it is not a problem to keep it alight. The ash holds on nicely at the foot and the cigar releases a generous amount of white smoke clouds. Great construction. The first third of the cigar is very sweet and smooth despite the few first rough draws. After the cigar settles down, the body evolves to a medium body and it is dominated by some creamy and sweet flavors (typical H. Upmann). There is a sweet earthy flavor, very much like a sweet American potato, there are some nuts too, some coconut. Some sweet toastiness as well, like caramelized onions, and some notes of cedar. There is also a good amount of spices but very light in taste, just enough to make the tongue tingle, and some hints of black chocolate. Overall, the flavors are very rounded and very savory. In the middle third, the flavor profile evolves slightly, still a lot of sweetness, more cedar, and with the addition of some coffee and some herbal notes. Towards the middle of the cigar, some sweet Chinese spices flavors join the mix, it is like a “sauté” sauce, a sort of mix of peanut butter and curry. There is also some notes of fresh baked bread, it is beautiful. The earthiness is still present, but not some much as sweet potato but rather like some wheat or some vegetables. The body remains in the medium range. In the final third, the Coronas Junior increases a bit in strength, towards a medium-to-full body. In terms of flavors, there is still a lot of cedar and of sweetness. There are also some vanilla flavors towards the end of the cigar. The cigar does not get harsh whatsoever, and can be smoked down to the band, until it gets too hot to hold. In summary, this is a true Cuban smoke, easy on the wallet, and that can both please novice smokers and experienced aficionados.